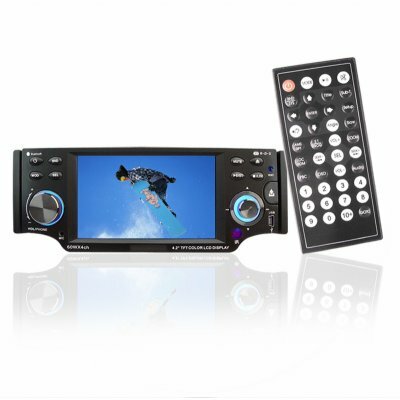 Successfully Added Car DVD MP4 Player - Motorized Detachable 4.2 Inch Touch Screen to your Shopping Cart. Single din entertainment system for playing not only DVDs and CDs, but digital files such as DivX and MP3, and coming with a very clear fully motorized 4.2 Inch TFT LCD display with touch screen ability and a detachable front panel design for security. With such excellent features as a built in USB port with a special touch screen menu for controlling digital music, along with multiple input and output such as Subwoofer OUT and AUX IN, and Bluetooth connection with a handy Bluetooth touch menu, this is a Car DVD system that is sure to make any car a real supped up ride. Absolutely no MOQ, friendly Chinavasion support, and one year warranty all go to make this a deal not worth missing..